The Langtry Manor premiere luxury hotel in the UK. Evidence of hotels and the hospitality industry have been recorded as far back as biblical times when Mary and Joseph arrived in Bethlehem during the census. As the Bible depicts, Mary and Joseph were refused accommodations because there "was no room at the inn." Since the beginning of time, people have traveled for commerce, religion, family, health, immigration, education and recreation. As cited by Texas Tech University, the word "hospitality" comes from the Latin root meaning "host" or "hospice." The university further noted that the first hotels were nothing more than private homes opened to the public. Most, unfortunately, had poor reputations. Under the influence of the Roman Empire, inns and hotels began catering to the pleasure traveler in an effort to encourage visitors. The first inn located in America was recorded in the year 1607 and lead the way with many other firsts in the hospitality industry. The first publicly held hotel (the City Hotel) opened in New York in 1792. The first modern hotel (the Tremont) opened in Boston in 1809 and the first business hotel (the Buffalo Statler) opened in 1908. From there a surge of hotels flooded American and the rest of the world with prominent names such as Radisson, Marriot and Hilton. 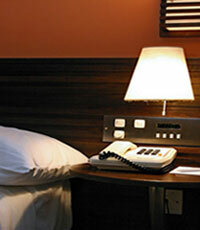 Budget hotels offer clean albeit simple rooms that provide the basics of places to sleep and shower. Usually budget hotels are designed for travelers looking to maximize their funds and minimize expenses. Prices can range from $20US per night to $70US per night. Business hotels offer a high standard by providing rooms equipped with what business travelers would consider necessities. Usually found in business-class hotel rooms are high speed Internet connections, alarm clocks, comfortable beds, irons and ironing boards, coffee makers, complimentary newspaper delivery and hairdryers. Rates can range from $80US per night to $250US per night. The facility of a business hotel would also offer an in-house restaurant, bar, exercise room and shuttle service to nearby airports. Limit concierge assistance is often included as well as room service, laundry and dry cleaning and wake-up calls. Luxury hotels are known for their lavish decor and extraordinary service. With superior amenities, accommodations at luxury hotels are designed to thoroughly pamper and impress guests. According to a Business Week Online article, those in the luxury market are getting harder to please stating that luxury goods and service providers can't afford to blunder with the level of service and customer experience they provide. For this reason, many luxury hotels go far beyond the norm by providing a lifestyle experience equal to or better than what guests have become accustomed to at home. Luxury hotels frequently offer full-service day spas, five-star restaurants staffed by world-class chefs, ballrooms, lavish pools, golf packages and guest services that are unsurpassed by any other class of hotel. In addition, luxury rooms generally include those amenities found in business class hotels plus in-room safes, goose down comforters and pillows, marble showers and tubs, larger rooms, separate sitting or living area and fog-free bathroom mirrors. Rates can range from $129US per night to $2,000US per night. Rates vary greatly depending on location and proximity to popular events and attractions. There are other classifications of hotels, however, most will fall into one of these three or a combination of these three. With the lines between business and personal becoming more blurred, many entrepreneurs and business executives will attend conferences or embark on business trips with family in tow. Hotels are aware of this common occurrence and have become adept at providing facilities and services both business and recreational travelers enjoy. Search and Go is a special features portal and directory that provides up to the minute information on every subject imaginable. If you need info ... then search and go!